Vertical Acrylic Display Case has 4 shelves for maximum display flexibility. Each showcase features 3 removable shelves for added versatility. This vertical acrylic display case measures 15 ½ " x 8 ½" x 24" (L x D x H) and is sized for a countertop. These showcases are constructed of crystal clear acrylic. 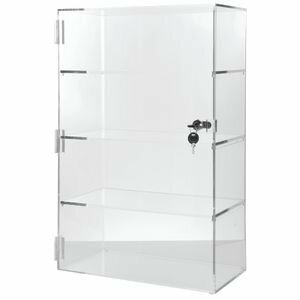 The vertical acrylic display is a valuable merchandiser that also provides security with a locking door. If you have any questions about this product by Retail Resource, contact us by completing and submitting the form below. If you are looking for a specif part number, please include it with your message.